The re-emergence of European integration as a difficult issue for the Conservative Party exposed the limits of Cameron’s modernisation project. In opposition, Cameron had defused the EU issue by lowering its salience but this suppressed rather than effectively addressed the issue, allowing Eurosceptics who favour withdrawal or fundamental renegotiation to shape the agenda. In office, new and familiar challenges emerged. The Eurozone sovereign debt crisis changed the dynamics of the UK’s relationship with the EU. Domestically, coalition with the Liberal Democrats and dissent from Eurosceptic Conservative MPs restricted Cameron’s room for manoeuvre, while the rise of the UK Independence Party (UKIP) added a new dimension to the problems the EU issue poses for the Conservatives. Cameron responded by promising that if the Conservatives win the 2015 general election, he will negotiate a ‘new settlement’ in the EU and hold an ‘in-out’ referendum. This article assesses whether this position amounts to a belated modernisation of Conservative policy that might both resolve intra-party divisions and settle the question of the UK’s place in the EU. Cash, W. and Jenkin, B. (2013) The EU single Market – Is it worth It? http://conservativehome.blogs.com/files/the-single-market-is-it-worth-it.pdf, accessed 1 February 2015. Cowley, P. and Stuart, M. (2014) The four-year itch, http://revolts.co.uk/wp-content/uploads/2014/06/Four-year-itch_cover_full.pdf, accessed 1 February 2015. European Mainstream (2014) In our interest: Britain with Europe, http://www.europeanmainstream.org.uk/in-our-interest-britain-with-europe/, accessed 1 February 2015. Fresh Start Project (2012) Options for change green paper. 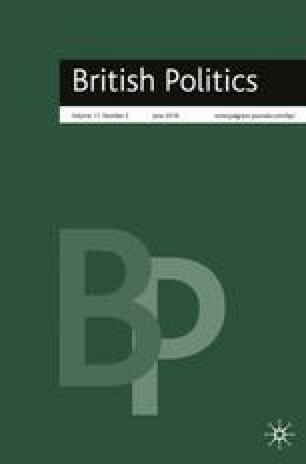 Renegotiating the UK’s Relationship with the EU, http://www.eufreshstart.org/downloads/fullgreenpaper.pdf, accessed 1 February 2015. Fresh Start Project (2013a) Manifesto for change, http://eufreshstart.org/downloads/manifestoforchange.pdf, accessed 1 February 2015. Fresh Start Project (2013b) Mandate for reform, http://eufreshstart.org/downloads/mandateforreform.pdf. Hannan, D. (2014) David Cameron has dropped the idea of a new deal – the EU referendum will be on the existing terms. Daily Telegraph blog, 13 June, http://blogs.telegraph.co.uk/news/danielhannan/100276242/david-cameron-has-dropped-the-idea-of-a-new-deal-the-referendum-will-be-on-the-existing-membership-terms/.